On May 6, 2018 presentation of the book “Kurmanzhan Datka” took place in the National Philharmony. This event has been dedicated to the 40th anniversary of the creative work of the poetess Bubaisha Arstanbekova, the honored worker of culture of the Kyrgyz Republic. Representatives of the Government of the KR, the Ministry of Culture, Information and Tourism of the KR, representatives of the Jogorku Kenesh of the Kyrgyz Republic, as well as the head of the Kurmanzhan Datka Foundation, the descendants of Kurmanjan Datka, who specially came to this event from USA, made speeches at the opening ceremony of the event. Representatives of the Eurasian Creative Guild, international organizations, the Writers’ Union, cultural and art figures have also attended the event. The event began with a short performance about the childhood, life and creative path of Bubaisha Arstanbekova. Bubaisha Arstanbekova began to get involved in poetry from school years, her poems were sometimes published in print. Since 1978, her poems have become widespread among the people. Famous composers have written music for more than 100 works by Arstanbekova. The song “Alymbek Datka” on the verses of Bubaisha Arstanbekova included into the gold fund of the National Television and Radio Company of the Kyrgyz Republic. Bubaisha Arstanbekov became known not only in the Kyrgyz Republic, but also abroad. The publication of her poem “urmanzhan Datka” is undoubtedly the crown of her activity. It has been translated into English and Russian languages and found its reader on the international level. 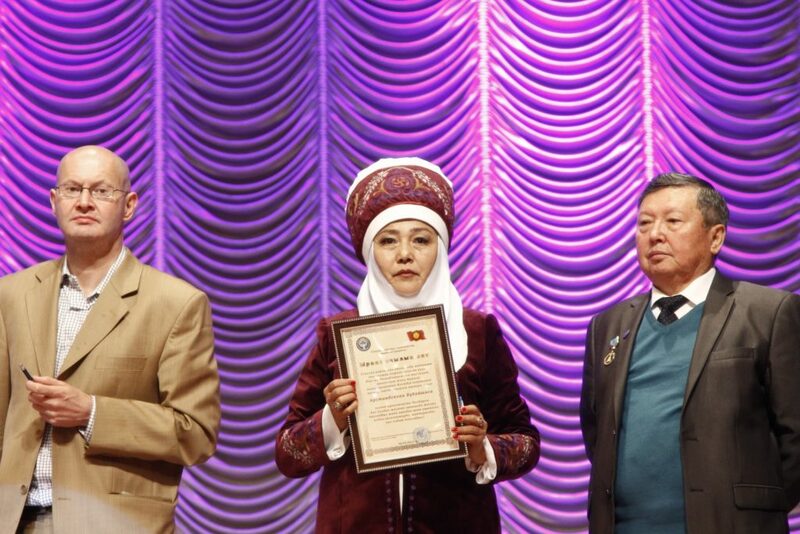 In 2014, the historical poem “Kurmanjan Datka” won the second prize in the international literary contest “Open Central Asia Book Forum & Literature Festival 2014” among participants from 20 countries. “The poem of Bubaisha Arstanbekova” Kurmandzhan Datka” made not only a significant contribution to this treasury of the grateful memory of descendants, it gives the reader a new look at the life of the Kyrgyz people, customs and traditions that surrounded the future queen from birth to the last way. Folk rites, conspiracies, and beliefs were carefully collected by the author and transmitted in poetic language as a constant background of the destiny of the historical personality. These amazing ethnographic findings naturally paint the atmosphere in which the great Kurmanjan Datka grew up, matured and formed – flesh from the flesh of his people, a true people’s leader, respecting and appreciating the customs and traditions of his ancestors. Bubaisha Arstanbekova’s book “Kurmandzhan Datka”, is a fertile material for studying the ethnographic field of national culture in addition to the value of the contribution to biographical research about the life of the historical personality. It can be recommended for compulsory reading in higher educational institutions of the country. We are sure that this poem and all her works will remain forever in the treasury of the Kyrgyz and world literature! Let the golden age of her creativity lie ahead of us all”.